New Gameplay Objects: The mischievous Spooky Candy Bowl and a new Pumpkin Carving Station. New Fun Decorations: Creepy Paintings that will change if you watch them,Spider Webs and All new tattered furniture to turn your Sim’s home into a creepy house of horrors.This pack also comes with decorative tombstones!There are a lot of glowing objects like an animated glowing cauldron, decorative ghosts and a lot of festive jack-o-lantern objects. 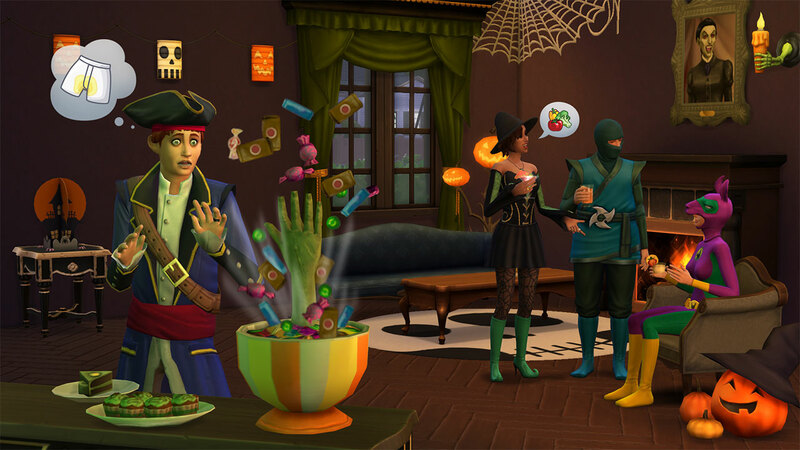 New Costumes:A variety of new costumes are also available to help make your party stand out, from Pirates and Ninjas to Super Llamas and Fairies, there are a bunch of great outfits for Sims young and old. 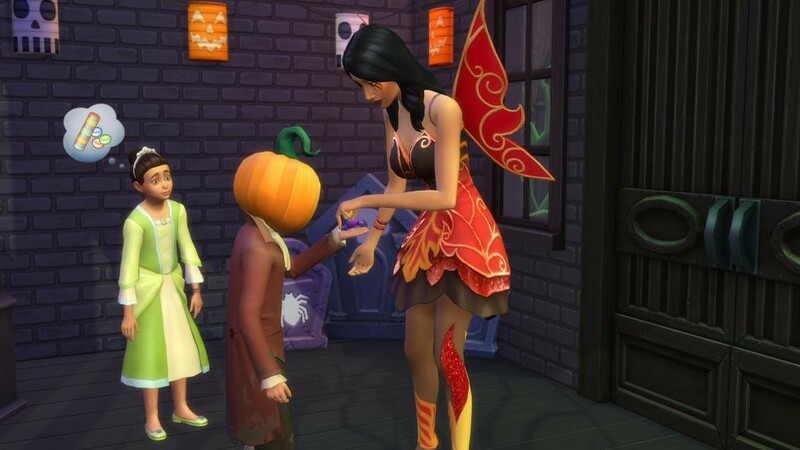 Of course, these costumes aren’t restricted to use at Spooky Parties, either – if you want to dress your Sim like a Witch year-round, you can totally do that. 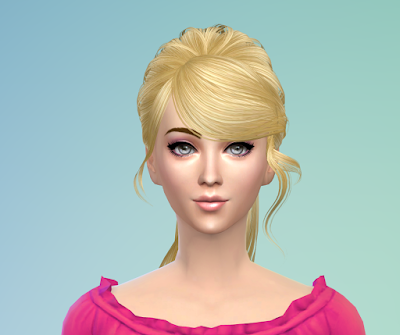 Kids can also wear new costumes and dress up like a skeleton or a princess. All the costumes come with a complementary hat. New Recipes:Eyeball Cheese Plate, Zombie Cake and Spooky Cookies. 1.Decorate your home with all the new spooky stuff and throw a Halloween themed Spooky Party. 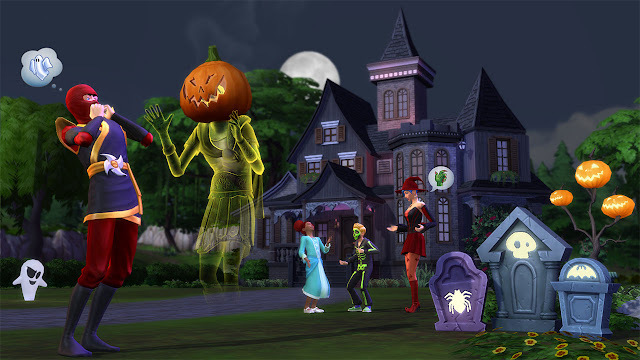 2.Your Sims can play Trick and Treat at the Spooky Party. 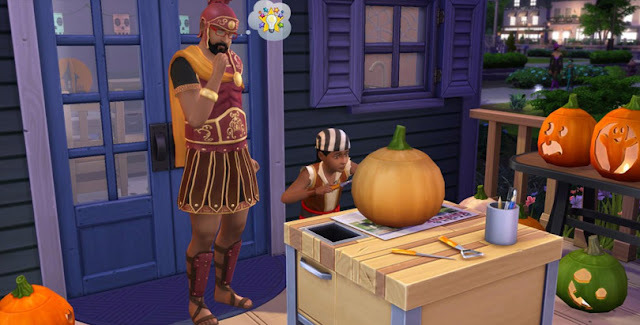 3.Your Sims can make festive works of carved art, creating the jack-o-lantern of their dreams.If your Sim has a high enough handiness skill, the pumpkin is infused with the Sims emotion. Place a candle in the jack-o-lantern or put it on your Sims head and start haunting the neighbors. 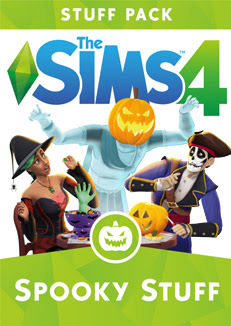 And if you didn’t like the result, you can smash the pumpkin into little pieces.And once the jack-o-lanterns are made, Ghost Sims can take a candle-lit pumpkin, put it on their head, and haunt up the night! 4.You can place the mischievous Spooky Candy Bowl to scare your guests a little.